Nizy’s Life Compendium has been nominated for a ”Very Inspiring Blogger Award” by http://yalandarose.wordpress.com/. I was really surprised and honored for the fact that people are finally starting to follow and seem to like and read my blog even if I just started blogging at WordPress this month. I continue to consider myself a newbie blogger. This award is for my inspiration, for the person that is living inside my heart. I am humbled that people find my blog interesting enough to nominate me for this Award. Once again THANK YOU to http://yalandarose.wordpress.com/ from the bottom of my heart. I absolutely love her blog too. It is also pretty inspiring – I vastly encourage you to check her out. #Thank the person who nominated you and link back to them in your post. #Leave a comment on each of the blogs letting them know they’ve been nominated. I think I am a pretty wise shopper. I love a good deal! When somebody broke my trust, I can will forgive but I will never trust ’em again. I have the ability to lift up someone’s spirit and provide encouragement when times are rough. I am a straightforward and adventurous type of person. I love to learn, and also love to share what I have learned with others. I love old people (I can easily get along with them). I am optimistic and open-minded. 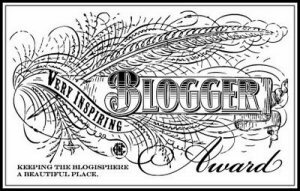 I am passing ”The Inspiring Blogger Award” onto everyone who writes a blog. You all inspire me in so so many ways. I thank you for the companionship and for your friendship. 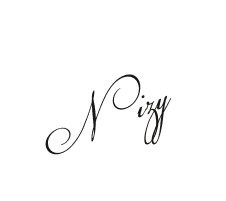 Thank you so much for the nomination Nizy! I am so honored! I will be working on my post about this today! You are such an inspiration to me and I wish I could nominate you again. I guess that would be pretty redundant though. However, you are the most inspiring blogger I know. You always bring a smile to my face and make my day! I love you my dear sister in Christ and if you are ever in the Houston area or north of that please give me a holler because I have a spare room that is reserved for you! I just know one of these days I will get to see you in person. Harley and I can’t wait for that day. Stay blessed my sweet friend and I hope you have an amazing week! Hi Kimmy, wow! thanks for your wonderful words… Thanks for uplifting my spirit, inspiring me with your sweet thoughts.. You have taught me a lot about friendship and strength since we first started talking, You are a beautiful person (and an amazing writer) and I am incredibly lucky to have you in my life! Thanks for being a true friend. Thanks for the comment, and I hope things are looking up for you! I have a feeling, God will find a way for us to meet in person someday. Much love to you and to harley. Always take care… I’m just a prayer away from you! Man, I love you girl! You are so sweet and truly an inspiration to me. I am so so blessed to have you in my life. Harley is doing good today. She is sleeping now. I keep praying that she will eat, she is so picky and refusing most of what I am cooking for her =(. Now she only wants things that I don’t know how to cook very well and are expensive, like salmon. This girl has expensive taste! She is worth it though and I know God will provide if it is His will. So blessed to have her and you! Take care my sweet friend.